This hotel is 100pct nonsmoking Located in the resort district of International Drive Hampton Inn Orlando-Convention Ctr-Intl Dr Area FL hotel features 170 hotel rooms 7 floors and interior corridors. 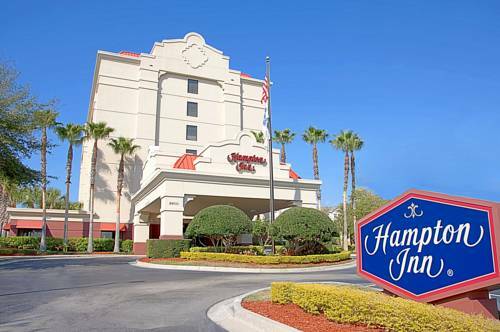 Our Hampton Inn hotel in Orlando Florida is located just 0.2 miles from the Orlando/Orange County Convention Center. Also within walking distance of our Hampton Inn Orlando-Convention Center-International Drive Area hotel of Florida is Pointe Orlando Mall which features upscale shopping and dining. Scheduled transportation to Universal Orlando SeaWorld and Wet n*Wild is provided by our Hampton Inn Orlando-Convention Center-International Drive Area hotel of Florida. Other Orlando Florida area attractions include Walt Disney World Dixie Stampede many world famous golf courses and Kennedy Space Center. Within blocks of Hampton Inn Orlando-Convention Center-International Drive Area hotel of Florida you can dine at Bahama Breeze Don Pablo*s Crab House Charley*s Steak House the Butcher Shop or enjoy room service provided by TGI Fridays. Among the outstanding amenities you will find at Hampton Inn Orlando-Convention Center-International Drive Area hotel are complimentary hot breakfast featuring On the Go breakfast bags complimentary wireless high-speed internet complimentary internet access computer terminal hotel room service provided by TGI Fridays and our 100 Hampton Guarantee. We love having you here at the Hampton Inn Orlando-Convention Ctr-Intl Dr Area FL hotel in Florida. Numerous Restaurants to choose from at both of these dining/entertainment/shopping complexes.